The award-winning Swiss Manager is an essential software toolbox for the demanding user. 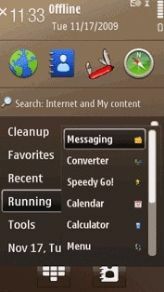 It contains three applications in one: task manager, system information, and file manager. Features include: floating status icon with time and memory display, management of running processes, memory optimization, advanced file display and manipulation, the most complete insight into phone features, and much more. 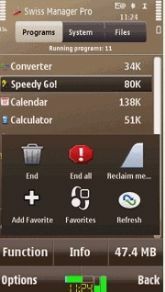 kang, lo pake symbian uiq bisa g ya? ada Swiss Manager utk UIQ. Cb googling.